Also known as the Western Trail, Fort Griffin Trail, Dodge City Trail, Northern Trail, and Texas Trail, this path wasn’t as well known as some of the other cattle trails, but it was longer in length and carried cattle for two years longer than did the Chisholm Trail. Following the Civil War, construction of the Transcontinental Railroad opened the West at the same time that Texas cattlemen were desperately seeking opportunities to sell their cattle. Early trails included the Shawnee Trail and the Chisholm Trail, which would go out of use as the railroad moved westward. In 1874 John T. Lytle, who was transporting 3,500 longhorn cattle from the grazing ranges of Texas to Fort Robinson, Nebraska, blazed the trail. The road began in the hill country of near present Kerrville, Texas and ran west of and roughly parallel to the Chisholm Trail into Kansas. 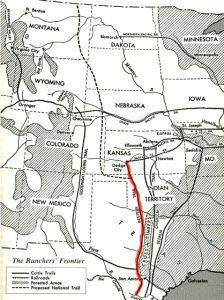 In 1875, when the U.S. Army successfully concluded the Red River War, which drove the Comanche and Kiowa onto reservations, Lytle’s trail became the most popular path to the railheads in Kansas and Nebraska. By 1879, it would become one of the most traveled and famous cattle trails in U.S. history. A typical cattle drive, moving 10-12 miles a day, would take about two months to travel from South Texas to Kansas. Though the cattle could be driven as far as 25 miles in a single day, they would lose too much weight and be hard to sell when they reached the end of the trail. In fact, if the cattle were skillfully managed, they could actually gain weight along the trail. Drovers learned the best size herd to move over long distances was 2,500-3,000 head, which moved slowly to avoid a stampede. Usually, the cattle were taken shorter distances each day, and allowed periods to rest and graze at midday and at night. To herd the cattle, a crew of at least 10 cowboys was needed, with three horses per cowboy. These men worked in shifts to watch the cattle 24 hours a day, herding them in the daytime and watching them at night to prevent stampedes and prevent theft. The crew also included a trail boss, a cook, who drove a chuck wagon; and a horse wrangler to take charge of the spare horses. The wrangler was often a very young cowboy or one of lower social status, but the cook was a particularly well-respected member of the crew, as not only was he in charge of the food, he also was in charge of medical supplies and had a working knowledge of practical medicine. The two-month trip would cost about $1000 in wages and provisions. At the end of the trail, cattle sold for $20.00 to $35.00 per head. At that time the cowboys were paid and turned loose. After months of monotonous work, dull food, and abstinence of all kinds, they got shaved and shorn, bought new clothes and gear, and often let off steam by drinking and gambling. End of the trail cowtowns were often known to be both decadent and violent, boasting numerous saloons, gambling halls, brothels. To curb this rowdiness, effective lawmen were needed. Some of the more famous of these were James Butler Hickok, Wyatt Earp, and Bat Masterson. 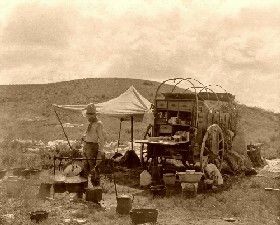 After the cowboys had rested for several days they usually returned home with their wagons and horses. Most of the cattle along the trail were shipped out of Dodge City, Kansas along the railroad. However, as cattlemen learned of the of the great open ranges to the north, many began trailing their herds further into Nebraska, Wyoming, Montana, the Dakotas, and even as far north as Canada. Despite its popularity, traffic along the trail began to decline in 1885 due to the spreading use of barbed wire fences, the introduction of beefier cattle breeds, and the settlement of the frontier. 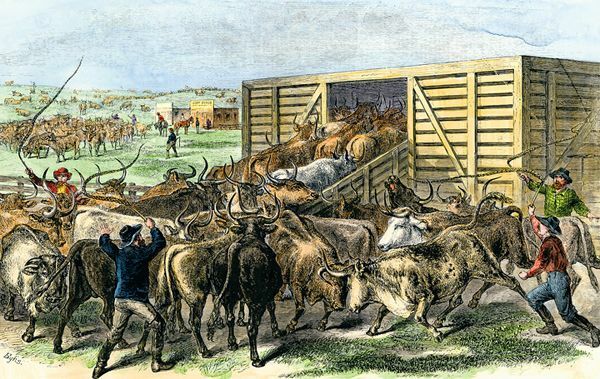 But the biggest contributor to the trail’s demise were quarantines of Texas cattle due to the “Texas Fever” – a disease spread by a parasitic tick. 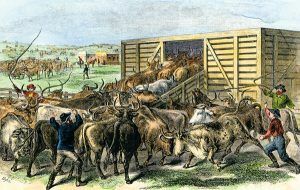 Carried northward by longhorns, the disease decimated northern herds, causing many northern states and territories to ban Texas cattle. 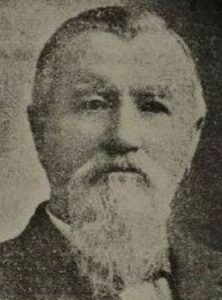 As a result, Texas congressman James Francis Miller, Art Lytle’s brother-in-law, introduced legislation that would have plotted a National Trail north of Texas under federal supervision, but the proposal did not pass. 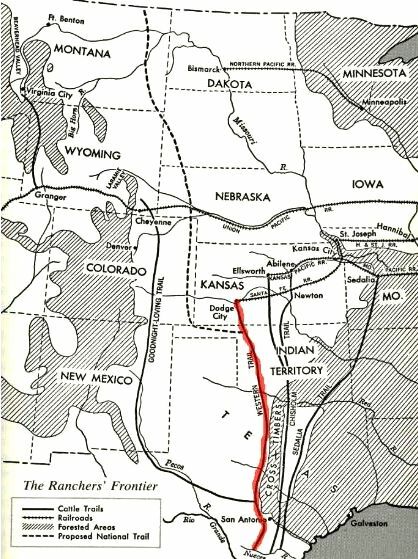 The last reported drive on the Great Western Trail was made in 1893 by John Rufus Blocker who drove his herd from West Texas to Deadwood, South Dakota. By then, as many as six million cattle and one million horses had been driven to northern pastures and markets along the route. Along this trek, Dodge City, Kansas boasted of being the “cowboy capital of the world.” Communities in other states, including Ogallala, Nebraska; Cheyenne, Wyoming; Miles City, Montana; and Medora, North Dakota, served the trade as well. Amarillo, Fort Worth, Buffalo Gap, Abilene, Doan’s Crossing, and Seymour, all in Texas were important stops along the trail.